Say it with me: “Skipping breakfast will not help me lose weight.” Here’s why: By eating smaller meals throughout the day, starting with breakfast, you will increase your body’s metabolism and burn more calories throughout the day. Breakfast should be full of protein and healthy fats (think scrambled eggs with avocado), which will fill you up with good nutrients so you don’t crave unhealthy snacks later! Still tempted to power through the day on coffee alone? Check out these pro-breakfast research results: People who eat breakfast consume more nutrients overall; have a lower risk of coronary heart disease; improved short-term memory and concentration; increased energy, and a more positive outlook throughout the day. If you’d rather eat paste than go jogging, then don’t make yourself go for a jog. Find another way to get your cardio in. Really, it’s ok. Exercise can be fun. It should be fun. If it isn’t, you’ll eventually fall off the fitness wagon. 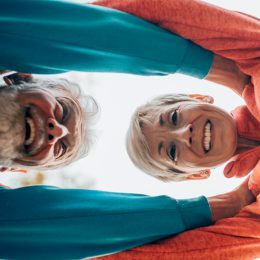 Take an exercise class with friends, join a walking group or hiking club, find machines you enjoy at the gym and grab a workout buddy, do a DVD at home… there are a lot of ways to effectively workout every day and actually enjoy it. Create a program you love, and you’ll be much more likely to stick to it! Cardio feels good – it gets your heart rate up, makes you sweat and requires endurance. After a good cardio workout, you feel “done”… but not so fast! 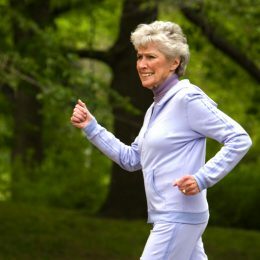 After age 30, our bones and muscles begin to weaken, and strength training is an important and necessary way to maintain our overall well-being. 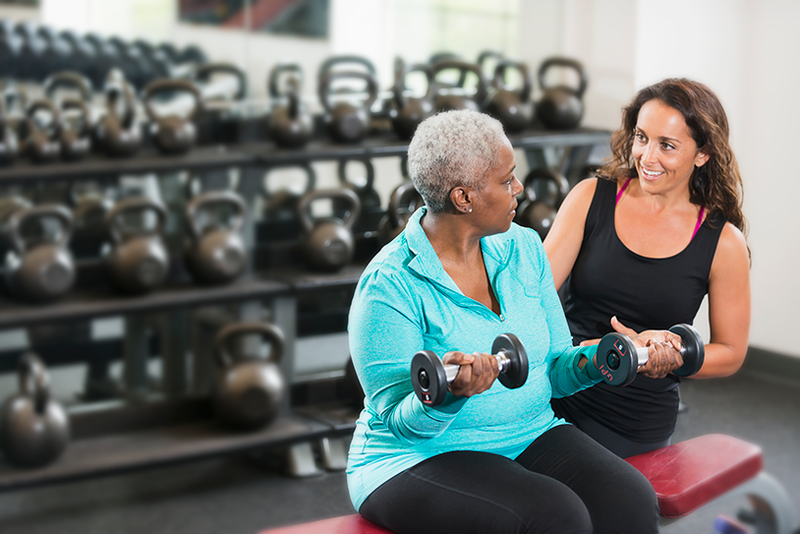 Strength training exercises improve balance and response time, help prevent falls, increase stamina, reduce depression and improve sleep, just to name a few benefits. Add strength training to your program at least twice a week to maximize your workout and your results! Albert Einstein’s definition of insanity is “doing the same thing over and over again and expecting different results.” It’s the same thing with your fitness routine. If you do the same exercises at the same speed for the same length of time each day, your body begins to adapt and adjust and becomes less effective. Switch things up – walk uphill one day, hike instead of run, try a different class at the gym. Keeping things fresh will keep you and your body engaged! Reading is great – read and learn as often as possible. It keeps your mind sharp, reduces stress and improves your memory. It’s an amazing thing to do for health! But not at the gym. Yes, it’s possible to read on a stationary bike or elliptical machine and it might make the time pass more quickly, but chances are you’re not getting a good workout. Focus on your workout and you’ll get more bang for your buck. But if you can’t get through it without a book, turn it into an interval workout. Stop reading every 3 or 4 minutes and pick up the pace of your workout to get your heart rate up for 2 to 3 minutes – your reward is another couple of pages! It’s harder to get back on track Monday if you’ve taken a major fitness detour over the weekend. Living a healthy, active lifestyle matters every day. That doesn’t mean you can’t have a “splurge” day and eat your favorite dessert, or that you have to go to the gym every weekend. But it’s also not a pass to spend Saturday and Sunday on the couch eating potato chips and watching TV. Schedule activities you love in your weekend plans – tennis, golf, hiking, a leisurely walk, swimming or throwing a ball with your grandkids. You’ll make invaluable memories, burn some calories and keep your fitness program on track! Scales make no distinction between fat and muscle so you could be two sizes smaller and weigh the same – truth! Remember… the scale sometimes “lies” but the mirror always tells the truth. If your workout routine includes cardio and strength training (as it should! ), the number on the scale may go up instead of down at first, but that doesn’t mean you’re not on the right track. (And it could demoralize you, unnecessarily!) Building muscle and lean tissue will ultimately help you lose weight, and you’ll see the difference in the mirror well before you see it on the scale. So put the scale away and focus on how good you look and feel. No matter how many minutes you spend on a treadmill, or how many miles you jog, you simply cannot outrun a terrible diet. There just aren’t enough hours in a day to burn off the excess calories. If your goal is to lose weight and improve your overall well-being, you may be surprised to learn that the work you do in the kitchen matters as much (or more) than the work you do in the gym. By fueling with nutritious foods, healthy fats, proteins and greens, you’ll give your body the energy to get in a good workout, and reduce your calorie intake so you can shed that layer of fat covering up the muscles you’ve be building underneath! To feel alert, energetic and ready to take on the day (and your workout! ), you need to get enough sleep. The “right” amount of sleep varies from person to person but, in general, if you’re not averaging seven to eight hours a night, your body isn’t reaching its full potential. Lack of sleep affects the quality of your workout, doesn’t give your body time to recover from your workout, and increases cravings and appetite throughout the day. Anything look familiar? 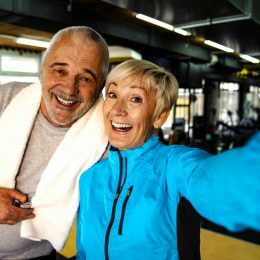 It happens to the best of us but, with a lifestyle tweak or two, you can get (and keep) your fitness program on track and reap the rewards of your healthy lifestyle! Previous PostThink chair exercises aren’t for you?